Our trendy retro Bar provides entertainment throughout the season. Serving up cocktails, best of our great local and interstate beers, Cider, Wild Brumby Schnapps. Basic Cocktails, Coffee, Beer, Tap and ​Basic Bar operations. Our very busy cafe is in the centre of the building and boasts great views. Serving breakfast, lunch and bar snacks all through the season. Serving, soy, decaf, hot chocolate, white hot chocolate, Dirty Chai, Espresso, Long Black. 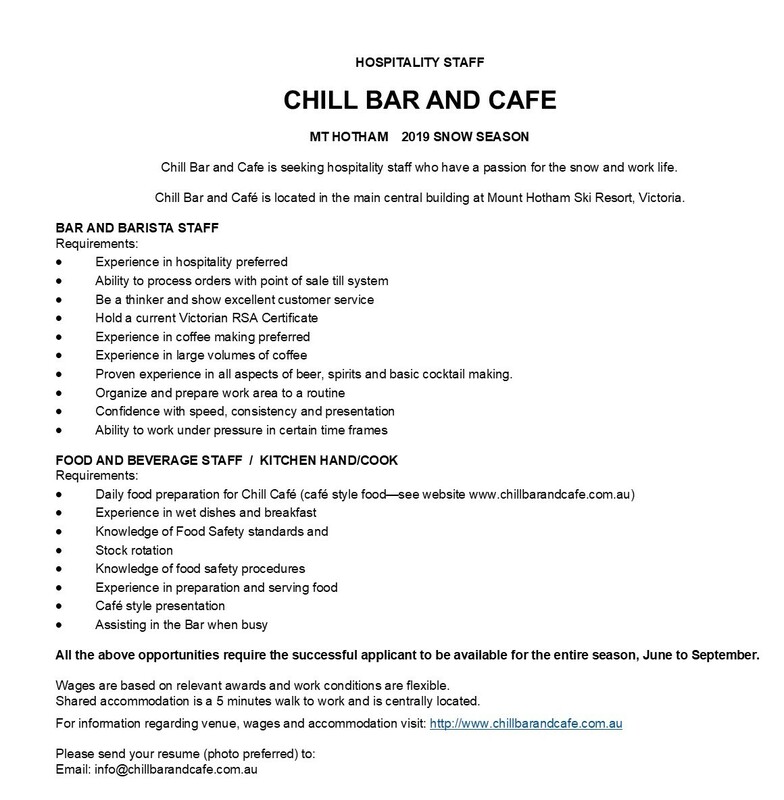 ​Chill Bar and Cafe employ's the best person for the job based on merit, experience, and personality. We aim to ensure our staff are engaged in what they do and have a passion for the snow and hospitality industry. Staff can also be trained in more than one area. All applicants will be contacted via email or text after they have applied for a position. Shortlisted applicants will receive a phone interview/s. Three or four phone interviews may take place before appointment is given and references will be checked, so be sure to include these in your resume. If you take another job please text 'OUT' to 0417 318 888. If no contact has been made we deem your have found other employment and your application will be unsuccessful.